Visitors to the Great Smoky Mountains National Park marvel at ridge upon ridge of seemingly endless mountains that stretch along the Tennessee & North Carolina border. 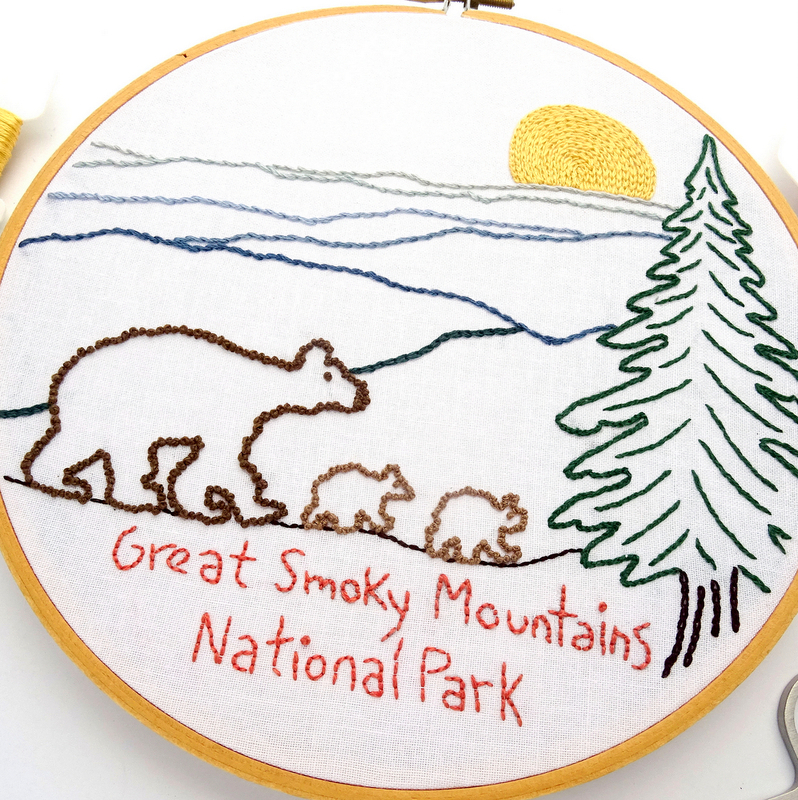 Capture the beauty and majesty of this park with an embroidery pattern featuring layers of smoky mountains, a towering evergreen tree, and a mama bear with her two cubs. Love this pattern and want to see more? 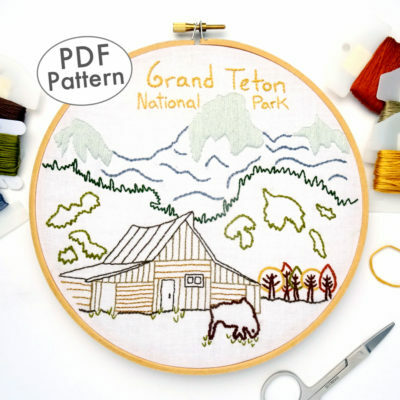 The Great Big Book of National Park Patterns features 10 hand embroidery patterns for the amazing price of only $30! Another Great Big Book of National Park Patterns features 10 more hand embroidery patterns! 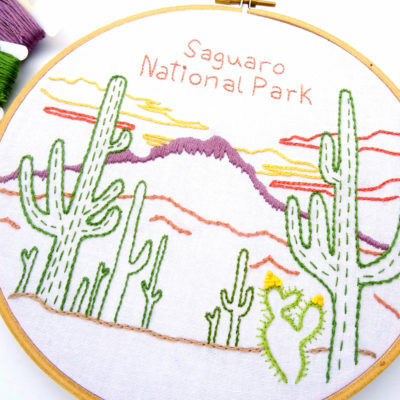 Saguaro National Park preserves and protects a striking desert landscape populated with cactus of all kinds. The park’s namesake – the majestic Saguaro – undoubtedly outshines them all. 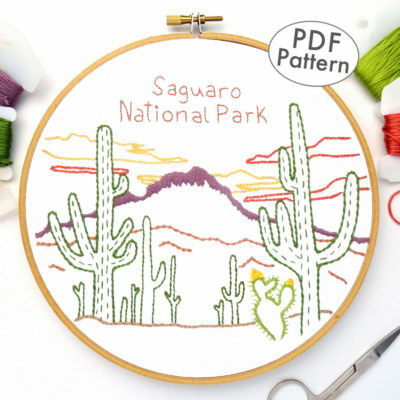 Create a unique piece of art with this embroidery pattern celebrating the saguaro cactus and the special National Park where it thrives. 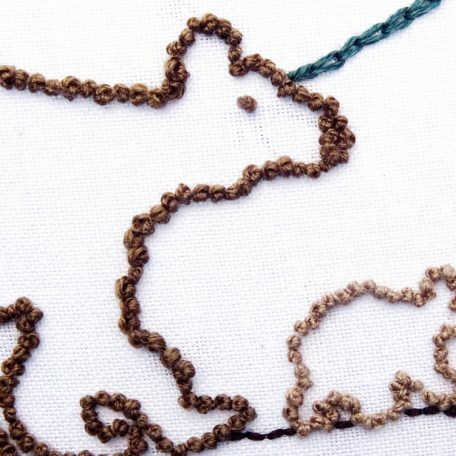 Love this pattern and want to stitch more? 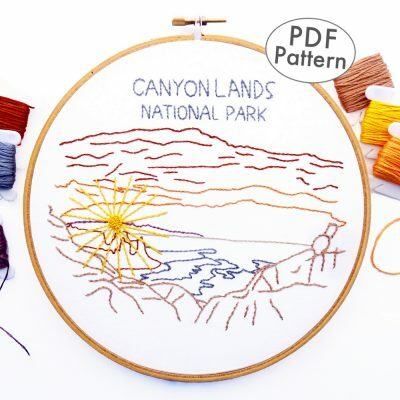 Another Great Big Book of National Park Patterns features 10 additional hand embroidery patterns! 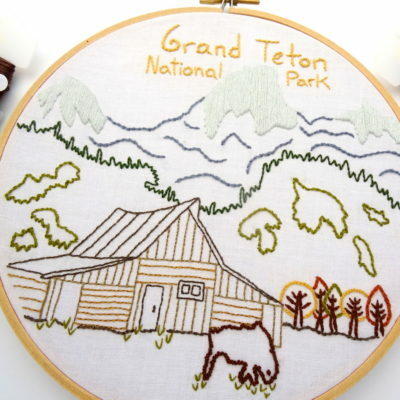 Dramatic mountains and stunning alpine lakes dominate the landscape of Teton National Park. By far one of the most popular views in the park is the famous T.A. Moulton Barn with the three main peaks of Teton range looming overhead. Photographers and nature enthusiasts from around the world flock to this historic location. Create a piece of lasting art featuring the famous barn, dramatic mountains, and surrounding landscape. 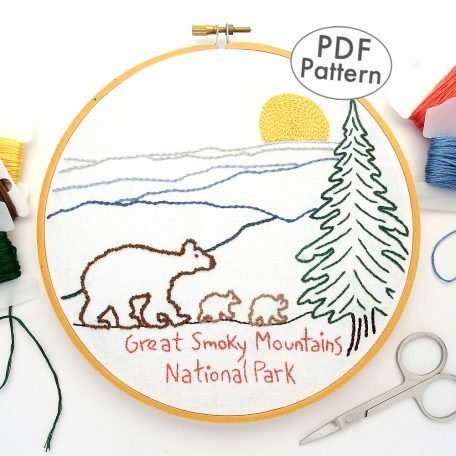 Designed with simplicity in mind, this downloadable PDF pattern uses only six different stitches and is the perfect project for novice and experts alike. Canyonlands National Park is known for its dramatic desert landscape carved by the Colorado River. Within the Island in the Sky district of the park, one of the most popular viewpoints is the Mesa Arch. Here, photographers and sightseers alike gather in the early morning hours to catch a glimpse of the sun rising through the arch. 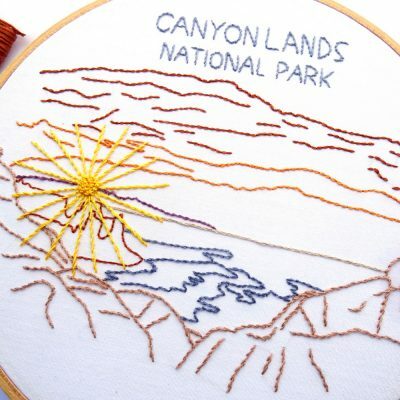 This one-of-a-kind embroidery pattern depicts the view from the arch at sunrise. A fairly simple pattern, this design only uses a handful of basic stitches and is suitable for both experienced stitchers and those who are new to embroidery. 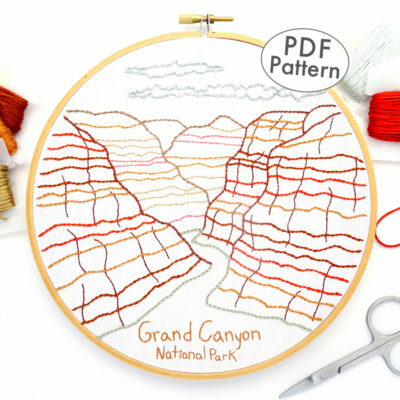 The grandest of all the national parks, the Grand Canyon is home to an immense gash in the earth filled with layered bands of red, gold & tan rock. 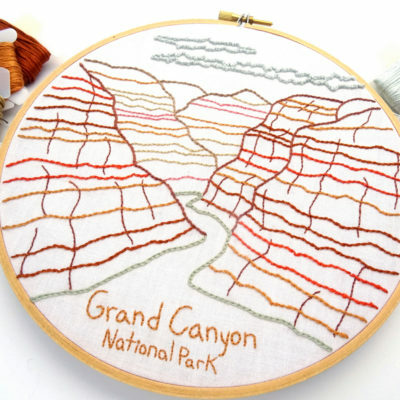 While it’s nearly impossible to capture the scale of this massive geologic wonder in a 7-inch round embroidery pattern, the view from river level – or from the bottom up – makes a fair attempt at demonstrating the scale. 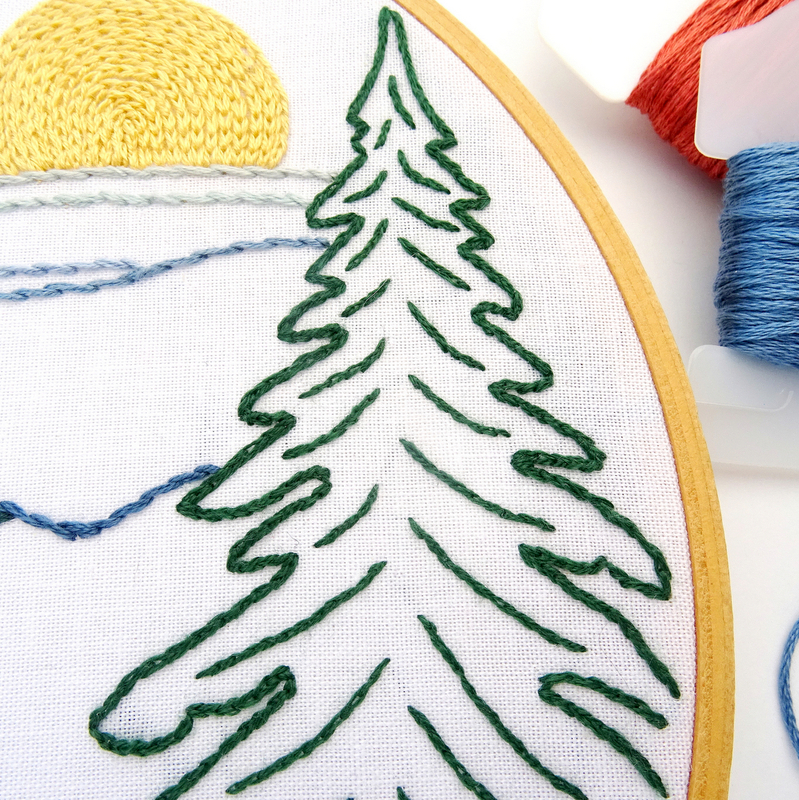 With all the layers, what looks at first glance to be a complicated pattern, actually only requires four different stitches and is a perfect project for novice and expert embroiderers alike. 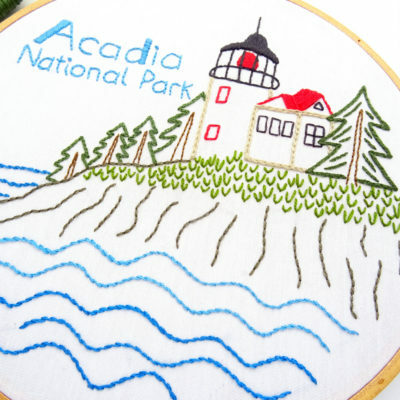 At the very southwestern corner of Acadia National Park in coastal Maine, sits a squat little lighthouse with a black pointy cap. Perched atop a craggy granite shoreline, the Bass Harbor Head Lighthouse guards the entrance to the harbor. Built in 1858, this still fully functioning lighthouse is open to visitors and over the years has become one of the most popular viewpoints in the park. 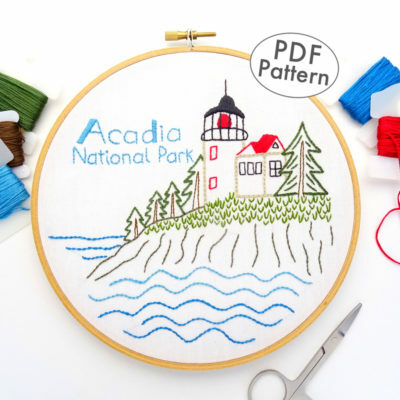 Capture the rugged beauty that is Acadia National Park with this simple yet detailed pattern featuring the famous lighthouse. 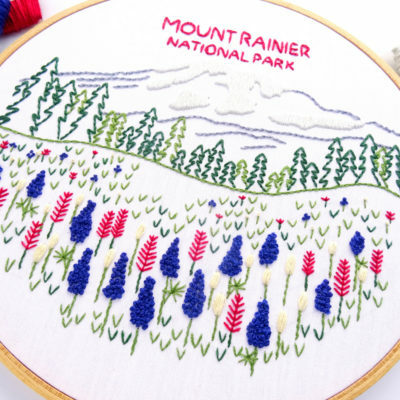 Those who are lucky enough to visit Mount Rainier during the late summer months will be treated to a vibrant floral display as the park’s meadows burst with colorful wildflowers. Within the park, one of the most popular areas for wildflower viewing is the Paradise Region. Here, wildflowers in every shade sway in the breeze, filling the meadows with brilliant colors. 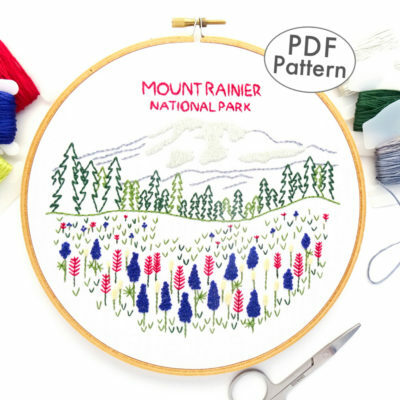 This hand embroidery pattern with its close up view of a brilliant flower-filled meadow, stately evergreen trees, and a 500,000-year-old volcano looming overhead, was inspired by the spectacular views from the hiking trails that wind around the Paradise Region. Designed with simplicity in mind, this pattern requires basic embroidery knowledge but uses only a handful of simple stitches. 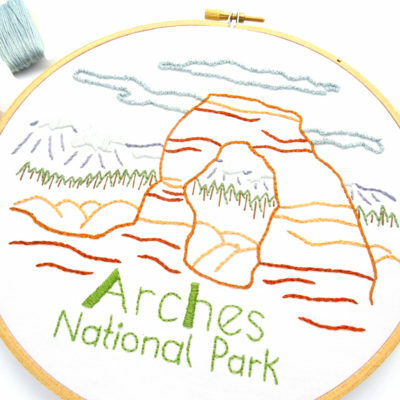 I’ve visited Arches National Park twice. Both times I hiked the trail to the base of Delicate Arch and marveled at the surrounding scenery. While the arch itself is a wonder of nature (not to mention the most famous and recognizable of all the arches), what makes the scene so striking is the contrast of red rock against the distant forests and snow-capped peaks of the La Sal Mountains. 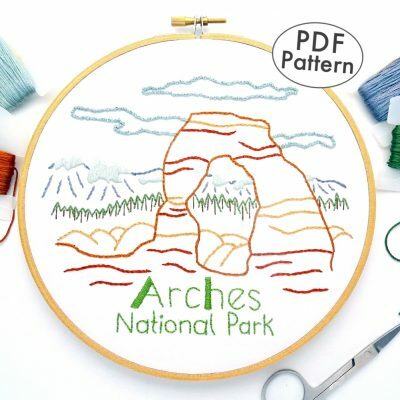 The Arches National Park pattern captures all of that and more with a classic scene featuring the Delicate Arch set against a backdrop of forest and mountains. 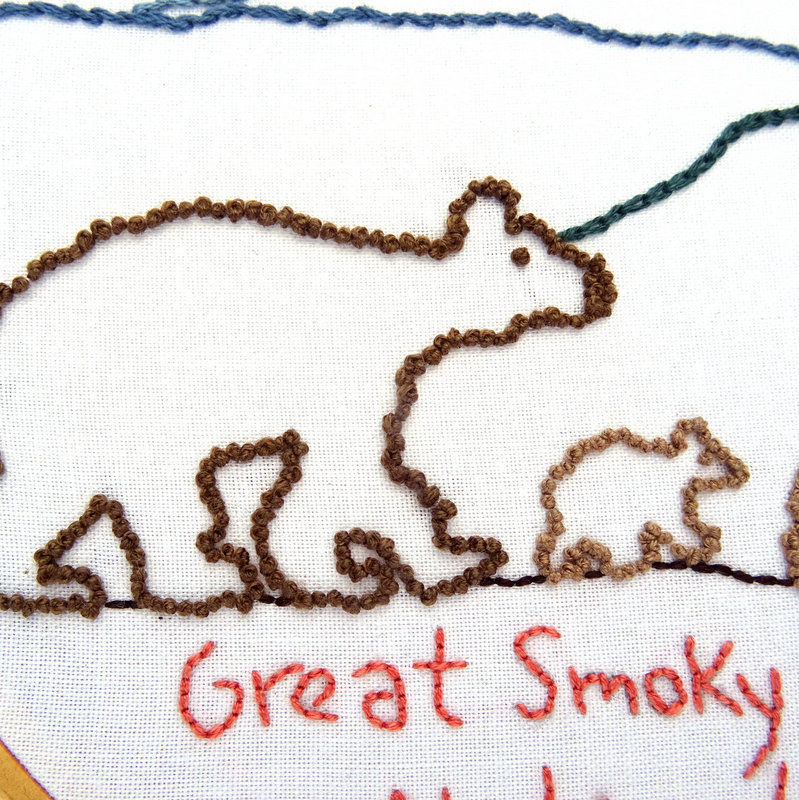 Designed with simplicity in mind, this pattern is perfect for both novice and experts alike. 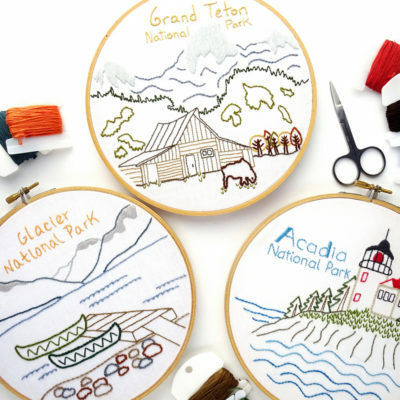 Now you can stitch National Park patterns for all your favorite parks! 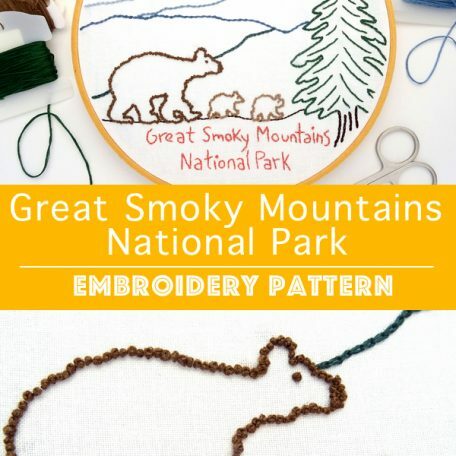 Ten hand embroidery patterns featuring the most popular U.S. National Parks compiled into a single ebook available for one crazy low price! 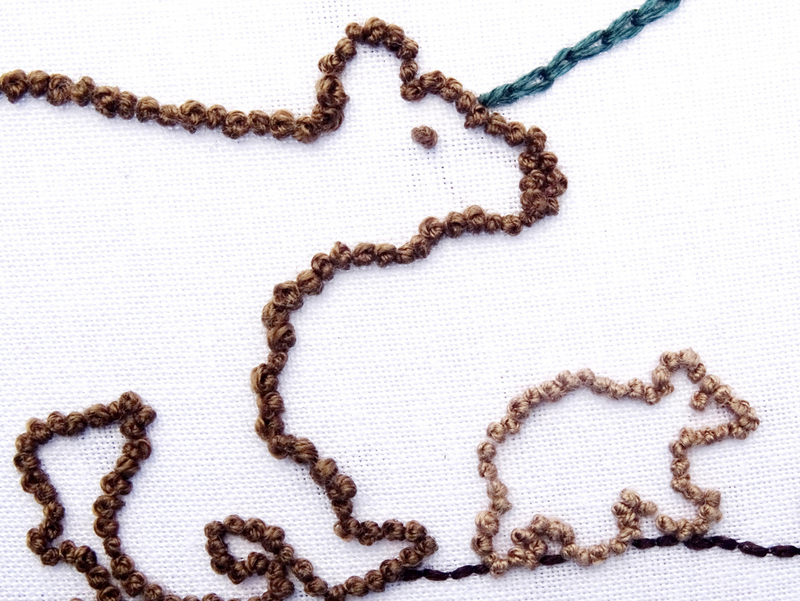 This file will be available for INSTANT DOWNLOAD as soon as your purchase is complete. The PDF document can be printed on regular letter size paper or viewed on a desktop, tablet, phone, or any device that is set up to view PDFs. 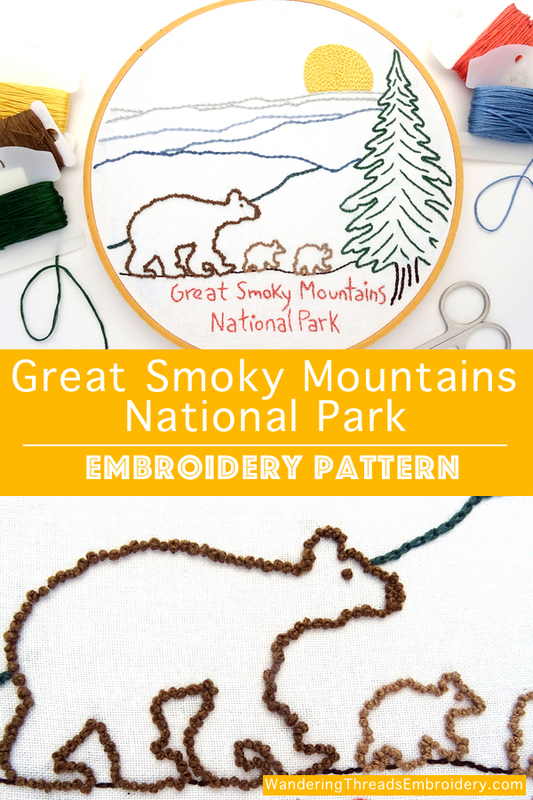 Love this ebook and want to stitch more National Park patterns? 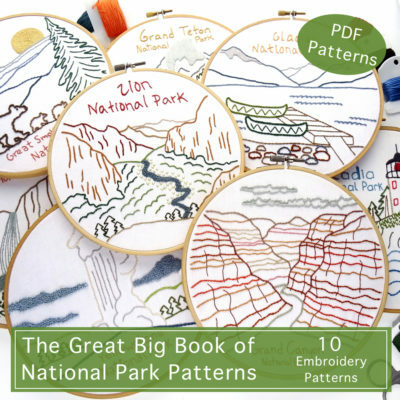 Another Great Big Book of National Park Patterns features 10 additional patterns!